Nahan – Beaver Junsar Magi festival is celebrated on January 11th in Giripar area of district Sirmour and some parts of Uttarakhand. On this day, about 40 to 45 thousand goats were sacrificed in both states. Giripar sector alone was reported to have cut over 13 thousand goats. whose price will be about 13 million. According to information from the primitive dimension standing tradition. According to legend in the golden age, when the mother was holding the ragged black god defends moved toward the north. Dewataaen the black during the day to cool the entire northern region of 28 Prvishte Paush Khapar same day of black goats sacrificed to fill the collective. According to information in the area every year on January 11 Giripar Magi is celebrated. The festival is in each family are sacrificed goat or ram. Before the house Kali for sacrifice is made sweet offerings. According to the information of district Sirmour Giripar area close to the 127 gram panchayats, 12 thousand more than half of the village more than 650 families to celebrate this festival. The feast day of the goat or ram reap golden castes, scheduled castes pig sacrificed. Over 12 thousand families Giripar sector alone half a goat is captured, while two to three goats too reap resourceful people. If the average price of a goat is pegged Rs 10 thousands Rs 13 crore this year in the Giripar Magi Feast of the goats have been cut. Also Magi Feast on local specialties flour and jaggery pudding, Askli, Ulole, Sutole etc. are created. 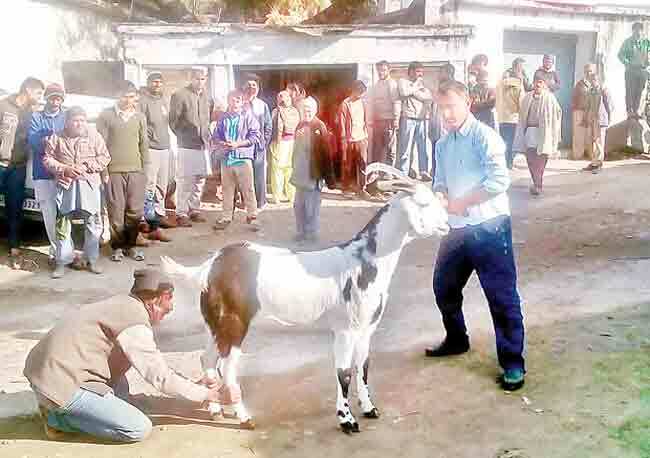 According to tradition, the entire Giripar in 28 Prvishte Paush goats are cut. Primitive dimension to the Goddess Kali was sacrificed to appease the gods, then, the tradition has been continued. Skanda Purana and is stated in the Markandeya Purana. Giripar centuries in terms of the social aspect due to snow or wether goat amputated to avoid those cold, cold winter weather can use the meet.